During times of crisis such as these, certain defensive stocks enjoy a bull run of their own, as money flows in from all directions to seek a safe refuge in them. TROUBLE IS a strange creature — it never comes alone. Just ask any Indian investor who is currently stuck in the market and he will bear this out. With most of us having got used to an extended period of stupendous economic growth, the ongoing crisis seems to have caught virtually everyone on the wrong foot. Not only are equity investors sulking because their portfolios are melting away like an ice-candy on a hot summer afternoon, but even the risk-averse investors who trust bank deposits over everything else are feeling cheated, as double-digit inflation is eating into the real value of their savings. In fact, at current levels, the real return from a bank deposit is actually negative, given that the rate of inflation now stands higher than the deposit rate. Even the one asset, which seemed to be inflationproof — real estate — is now starting to show signs of softening. And if the performance of real estate stocks were anything to go by, then one will have to say that the worst for real estate prices is yet to come. So, in a market such as this, the question that everyone is asking is that does one invest with an eye on the long term or just wait for the proverbial bottom to be reached? We believe that this might be an excellent time to enter the market, especially for those who have a longterm outlook. While double-digit inflation is hammering the equity market, ironically the truth is that it has made stocks a compelling investment choice by ruling out fixed-income instruments. Moreover, during times of crisis such as these, certain defensive stocks enjoy a bull run of their own, as money flows in from all directions to seek a safe refuge in them. These stocks, generally, have a strong cash flow, dividend payouts that match earnings growth, low debt or inelastic demand for the products or services that these companies make. More often than not, these companies are dominant forces in their industries to such an extent that they can become price makers and thereby insulate their bottomlines from the vagaries of inflation. They need not necessarily possess all of the above, but very often they will meet more than a couple of the above-mentioned criteria. Given our belief that in even the worst of markets, there is always hope we at Investor’s Guide decided to search for some compelling ideas that long-term investors can enter at the current levels and probably accumulate further if the market continued to slide. In order to pick this rather select band of stocks, we looked at the financial performance of leading companies across sectors during the last economic downturn, which began in 1997. It was pretty similar to the current downturn in that, it too was preceded by a high inflationary period. At its peak inflation, which peaked in 1998, soared to around 13%. This was followed by a period of stagnation in corporate earnings. And this was clearly reflected in the trajectory of the Sensex, which stayed flat during this period. In fact, if not for the traction provided by IT stocks such as Infosys, Wipro and Satyam during the dot-com run, the Sensex would have done even worse. Sans the IT pack, it was a bad period for old economy companies. 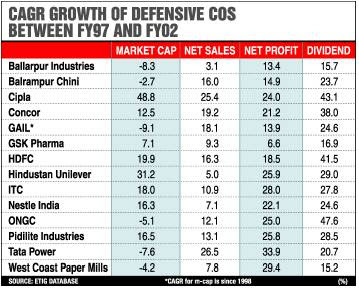 Companies ranging from sectors as diverse as capital goods, cement, steel, construction, automobiles and hospitality among others, all witnessed slow topline growth coupled with declining or stagnant profitability. However, if we exclude the big names of old economy, leading companies in quite a few sectors displayed strong earning and dividends growth during this period. In many cases, the market recognised this and there was a corresponding rise in the market cap of these companies. Even when the market failed to reward the growth of these leaders, they were more than made up by generous dividend payouts by these companies. Nonetheless, shareholders gained. Most of these slowdown busters are still around and we expect them to outshine the broader market once again. Especially, given the fact that this may not be a full-blown slowdown as we witnessed during that period, the recovery may take place much soon. WHILE our list of storm shelters include the usual suspects from typically defensive sectors such as fast moving consumer goods and pharma, it also includes companies from capital-intensive sectors such as power and oil & gas utilities. While it’s obvious for assetlight and cash-rich FMCG and pharma manufacturers to make it to our list, the latter are there because their financial fortune is, to a great extent, dependent on government regulations rather than market forces. For instance, the price at which NTPC sells its power to consumers is determined by the Central Electricity Authority and not by the forces of demand/supply. What’s more, the fact that the tariff is determined in such a manner that NTPC is virtually guaranteed a minimum 14% return on capital employed (RoCE) regardless of what the state of the economy or the inflation numbers are. The same is the case with companies such as Tata Power, GAIL and IGL, where pricing power remains intact even in periods such as these. That said, we have decided to steer clear from large energy utility companies which are in a high investment phase and where the benefits of the same will kick in only a couple of years down the line. Stocks not to Buy at this moment !! Other group of stocks in our list includes agri-commodity producers such as sugar and paper makers. While the former’s fortunes are linked to the sugar cycle, the latter is a staple product with inelastic demand. In fact, in recent times paper is one industry where realisations have shown a massive up-tick and demand outstrips supply by far. And this mismatch is likely to continue for at least a couple of years before any fresh capacity comes into play. All in all, we believe that these stocks make sense for those of you whose sole aim while investing in equity is not a quick appreciation in capital. For in the long run, both with the kind of dividend payouts that you will receive and the long-term appreciation these stock may just give you better returns than any other avenue.